I was supposed to spend 2014 finishing my first book Teaching Machines. But that didn’t happen. It didn’t happen for a lot of reasons, many of which have to do with the economic realities of being a woman outside of academia, outside of mainstream journalism writing about ed-tech. Strangely, I don’t get offered big book deals. Instead I spent much of 2014 on the road, traveling and speaking extensively about ed-tech’s histories, ideologies, and mythologies. People will pay you to keynote, I’ve learned, (or at least, they'll pay your travel expenses) even if you insist that you're a writer, not a speaker. So I wrote, and then I read aloud. And somewhere along the way I realized that, while I hadn’t finished Teaching Machines, I’d actually written something else. A different book. I’d written it piece by piece, keynote by keynote, lecture by lecture, chapter by chapter. And so I’ve pulled it all together in a self-published book. 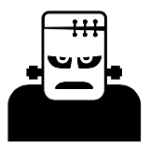 The Monsters of Education Technology is a collection of fourteen of my talks on topics ranging from teaching machines to convivial tools, from ed-tech mansplaining to information justice. Thank you, as always, for supporting my work.